Horizon Nuclear Power is moving ahead with its proposed new build at Wylfa, Anglesey, with the launch of the next phase of discussions with government and the submission of detailed plans for the new power plant. 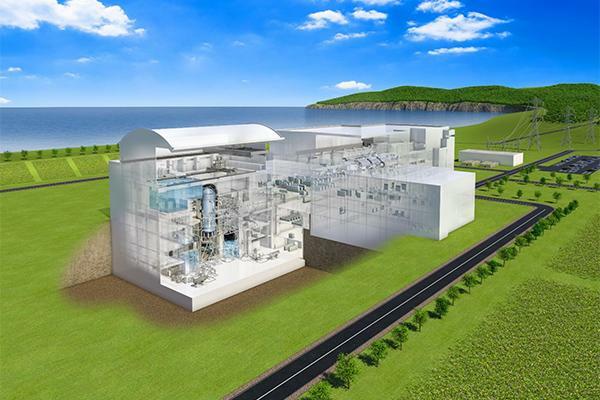 Horizon is owned by Hitachi Ltd of Japan, and proposes to build two Hitachi-GE 1300MWe advanced boiling water reactors (ABWRs) at the Wylfa Newydd site. Business and energy secretary Greg Clark MP has confirmed that Wylfa Newydd is the next project in the UK’s new build programme, following EDF Energy’s Hinkley Point C, and that the UK government is entering into detailed negotiations over financing and the cost to consumers of electricity from the new plant. Duncan Hawthorne, chief executive officer at Horizon, welcomed Clark’s statement as a clear signal of the government’s commitment to delivering a low carbon future for the UK. The ABWR completed the government’s generic design assessment (GDA) process in December 2017. Horizon has now submitted its development consent order (DCO) application to the government’s Planning Inspectorate. This comprises some 41,000 pages, 440 documents and over 400 drawings specifying the ABWR power station and associated work at the Wylfa Newydd site, and how Horizon plans to build it. The DCO process will include a public consultation, and is expected to take around 18 months from submission to decision. Horizon has also applied for other key consents including a marine licence and permissions for combustion and water discharge during construction and operations. Hitachi estimates that around 60 per cent by value of the first ABWR at Wylfa Newydd will be sourced in the UK, with more local input into later plant.